The guns will be among the highlights of Gavin Gardiner?s annual auction of Fine Modern and Vintage Sporting Guns, which will be held in association with Sotheby’s. The sale, now in its 45th year, will take place on the evening of Monday, August 20, 2012 at the prestigious Gleneagles Hotel in Auchterarder, Perthshire, Scotland. 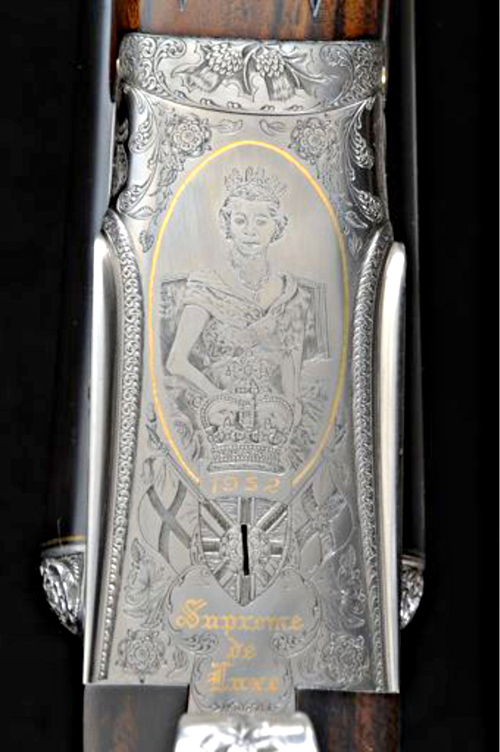 The guns are profusely engraved by well-known British engraver, Geoffrey Casbard, with scenes from the Queen?s Coronation of 1953, the Royal Palaces and scenes from the Queen?s life until the 1977 Jubilee. The engraving is further embellished with flags and royal motifs, portcullis decoration and the Tudor Rose emblem. The guns took over four years to build and remain in a virtually new and unused condition. Highlights from the sale will be on view at the CLA Game Fair, which this year will be held at Belvoir Castle, Leicestershire, July 20-22, and then at Sotheby?s New Bond Street, London on August 13-14. Auctioneer, Gavin Gardiner, commented: ?I am delighted to be returning to Scotland for my annual sale at The Gleneagles Hotel. This world renowned and historic auction is held eight days into the grouse shooting season and is a sporting highlight for shooting enthusiasts and collectors from all over the world.? ?I am extremely pleased to say that more world record prices for sporting firearms have been achieved at this venue than at any other, and the quality of the guns offered always reflects the stunning location in which the auction is held. ?